The event was held this past weekend with an elite men’s race attracting over 50 top international male triathletes, and the elite women’s race featuring over 30 top female triathletes, with the women’s race serving as the highlight for most Bermudians as we were able to watch our own Flora Duffy race to victory on home soil. The elite races were broadcast internationally, with the BTA noting this included the three countries that “have the biggest impact for Bermuda tourism” – NBC Sports in the United States, CBC in Canada, and BBC in the UK. In advance of the elite races, there were amateur age group races, which also attracted some international competitors, a kid’s race, feather mile and an opening ceremony, with the triathlon festivities spanning three days. In explaining the logistics behind the management, the BTA told Bernews, “The Bermuda Tourism Authority established WTS BDA Ltd. as a separate entity through which the MS Amlin World Triathlon is managed administratively. 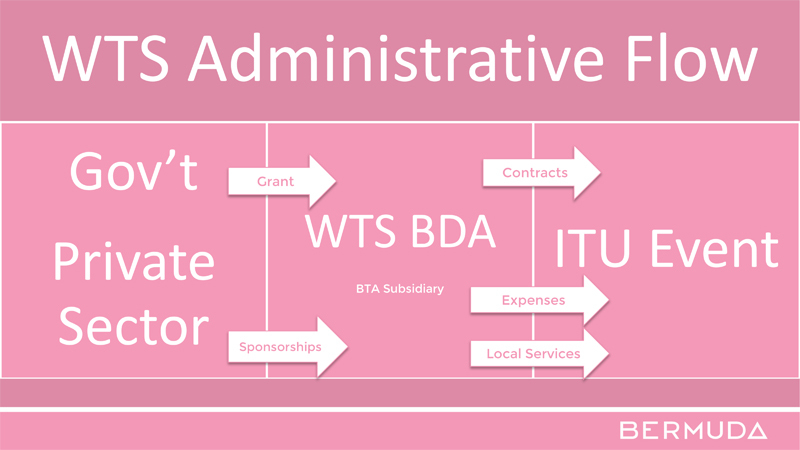 “Investment into the event — government grant, sponsorships etc — flow into WTS BDA Ltd. and out again to cover related costs such as local services, and contracts. “Private sector sponsorship funding – in cash and in kind – has facilitated enhancements to the event, beyond the required technical operations. This is in order to set apart the World Triathlon Bermuda experience from the other seven stops on the global circuit. “For example our Opening Ceremony is distinctly different from anywhere else – not to mention the kids’ duathlon and local legacy training programme. “This is a three-year endeavour for Bermuda, hopefully leading to a Grand Final event in 2021. Fundamentally, the goal is to cover costs and leverage the longer-term value through a healthy return on investment. The BTA added that there will be a report that gives information and data as far as ROI analysis. What a wonderful article outlining with clarity and transparency the long terms goals of this significant investment and meaningful event. I admire the BTA and all involved in making this possible. Bermuda demonstrated just how supportive we as a community are of our own athletes and how respectful we are of those visiting our island – some for the very first time. Ms. Duffy’s performance on and off the field was and is an inspiration to us all. Please keep up the good work BTA and everyone involved! Correct me if I am wrong though didn’t the BTA say this about Americas Cup as well? I am pretty sure we just dropped everything America’s Cup-related. Sure we can use it as a feather in a cap to get other events, though surely we can leverage other opportunities to take advantage that we are, and always will be the Home of the 35th America’s Cup. So not sure how the BTA defines a legacy event. I also fail to see the “ROI” on this event with $2.8 Million invested. Will there be a PWC report on this event series, like there was for America’s Cup? Flora Duffy has tremendous local support from across all walks of life. The same cannot be said of the Americas Cup.